Have you ever felt you made a mistake in your small business? Do you blame yourself for playing small or not being ready to take the next step? Waiting until I felt ready and thinking small were some of the mistakes I made in my business. They are common startup mistakes! In today’s episode, part two of my series on business mistakes, I talk about adopting an entrepreneurial mindset that helps you reframe mistakes into positives and to get out of your comfort zone so you can grow your business. How you can reframe the mistakes you may have made in your business and start to see them as exciting opportunities to evolve and grow. 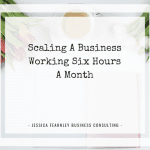 Why keeping yourself small can be detrimental for your business and why you should extend beyond what you think is reasonable when you plan and set your goals. Why I believe that in business you have to throw yourself in even when you don’t yet feel ready to. To connect with Louise, head over to The Social Bee. You’ll find the link to her latest podcast episode and to her Facebook group, where you can find out more about the online summit Louise is organising. If you enjoyed this episode and want to know more about my membership, The Business Club for Grown Ups, applications are currently open for a limited period of time. Click here to apply. I’d love it if you could leave me a review on iTunes. Thanks for listening!